March 28, 2016	(Press Release) - On the first day of April the owners of the recently merged Carolinas Net Care LLC will open its doors for a public celebration. And there are so many reasons to celebrate. "Carolinas Net Care LLC has been serving the Charlotte area now for ten years," says Greg Aker, co-owner of the original company with Fred Longietti. "We've come a long way. It's time to show appreciation for our clients and to get the word out about just what our recent expansion means to the long-term success of clients—past, present and future." 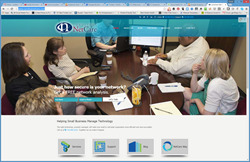 In January, Carolinas Net Care LLC merged with I.T. Innovations, operating in Charlotte since 2000. Aker says the joint venture offers clients a broader scope of engineering expertise, as well as a comprehensive knowledge base of hardware and software innovations. Marking a decade of service to small and midsize businesses, the expanded company has released a new website. Lee Eskridge, merger partner, formerly of I.T. Innovations, summed up the sentiment of the new leadership team: "We wanted to develop a site to help smaller businesses understand how they can tap the expertise of an in-house IT team at a price that allows them to focus on service and profitability." The new site, which went live on March 25, lets visitors browse the company's full range of services and learn more about its signature commitment to client support. In addition, the site offers testimonials from clients that have benefitted from the company's offerings, becoming loyal and long-term partners. The April 1 Open House and Media Event will be held at the offices of Carolinas Net Care LLC, located at 5950 Fairview Road, Suite 712, from 11am to 2pm. The public is welcome. Carolinas Net Care was formed in 2006 when Greg Aker and Fred Longietti decided to pursue a common vision for providing enterprise level technology management for small to midsize businesses. The company merged with I.T. Innovations in 2016 and owners Lee Eskridge and Max Haithcox. With a focus on providing IT service excellence, the expanded firm has a reputation for its relational approach, its wide range of services, and its proactive methodology to IT advising and servicing. The company's staff consists largely of technical engineers with extensive industry experience and holding a variety of industry certifications.